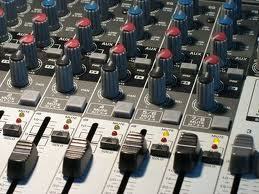 Once you have your music mixed, you will need it mastered as well. When mastering one song, the mastering engineer will need to make sure the overall tone of the song sounds great. He or she can add a bit of EQ to correct small issues. The engineer will also try and make the song sound a bit louder without distortion. This can be achieved with a limiter. There are also some other tricks of the trade a pro mastering engineer will use to make a song sound perfect when played back from any source whether it be a car stereo, or an iPod. Keep in mind, a mastering engineer cannot fix a song if it was mixed horribly. He or she must have a solid mix to work with. When mastering an entire album, the mastering engineer applies the steps above, but will also make sure that the volume level of each song flows together as one. This means that track 3 will not play louder than track 8. He will polish the overall sound of the album with light EQ so one song does have too much bass or another too much treble. Mastering is considered an art that takes years of practice and good equipment to make songs sound "industry quality". Practice makes perfect. Try doing different master songs and put them all on one CD. Then take the CD and listen in your car and see what sounds the best. Listen to your favorite industry standard album, try to copy that sound. There are many steps to mastering. This just touches the surface of what seasoned engineers do.